The tale of Europeans explorers’ arrival in the Americas is a dark one, coloured by slavery, slaughter, and smallpox. But a new study calls key details of that story into question, including how quickly Native American societies succumbed to disease, and how Earth’s climate responded. While many scholars believe that the diseases brought by early Spanish explorers spread like wildfire across North America, research led by Harvard anthropologist Matthew Liebmann indicates that the demise of native populations was much more gradual. 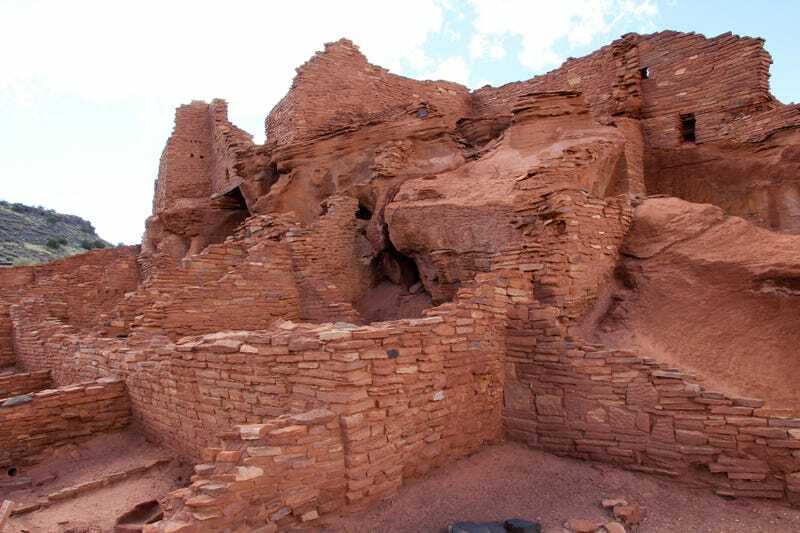 In the Pueblo communities of the American Southwest, disease didn’t break out until around 1610 — roughly a century after Europeans made first contact. To reach that conclusion, Liebmann and his colleagues turned to LiDAR, a remote sensing technology that uses lasers to penetrate thick vegetation and map the ground beneath it. With LiDAR, Liebmann was able to reconstruct the architecture of 18 Pueblo villages located in present-day New Mexico. Harvard graduate students used this data to work out the volume of each building, and estimate how many people lived in it. According to Liebmann, most villages were home to anywhere between 200 and 500 people around the turn of the 16th century. The date at which each village collapsed was established using tree rings growth patterns. In each case, the researchers found that tree growth took off between 1630 to 1650, suggesting that the people who’d been logging for building materials and firewood had vanished. Liebmann estimates that the population across the region dropped from roughly 6,500 individuals to less than 900. According to Liebmann, the timing of this die-off is quite telling. It wasn’t due to the Pueblo Indians’ first contact with Europeans, which occurred around a century earlier. His hunch? It was probably European livestock. “There were probably only one or two Europeans with boots on the ground in this region at this time,” he said. “But the other thing that’s coming into America at the time is livestock — cattle, sheep and pigs. I think there’s a strong possibility that animals were as much a vector of disease as Europeans.” Liebmann points out that around the same time as the Pueblo population crash, pigs brought over from the Old World were starting to multiply like crazy in the Southeast. It’s a theory that has yet to be verified. But when European diseases eventually struck North America, the impact reached far beyond humans. As Liebmann’s tree ring data indicates, forests around Pueblo villages began to grow back thicker after people disappeared. And in this dry Southwestern climate, more wood meant more fuel for fires. The ecological shifts Liebmann and his colleagues see in the Southwest — more trees, more fire — stand to inform an ongoing debate about how much the arrival of Europeans in North America impacted ecosystems and global climate. Archaeologists working in the Amazon also believe that the loss of native populations led to increased forest growth, and additional sequestration of carbon from the atmosphere. Some have even gone so far as to suggest that forest regrowth after the demise of South American societies led to a global cooling event right around 1610.